We invite you to explore India - the Land with infinite beauty ! Whether you soar high into Himalayas or peer under the ruins of the Ancient monuments dotting the landscape of India, you will cherish the experience long after your visit ! This India Travel Guide on Qutb Shahi Tombs is free from any commercial interest! This site is dedicated to promote India - the vast subcontinent, its glorious past, magnificent landscape and its infinite variety. You can enjoy a magnificent view of Golconda Fort from the gardens of Qutb Shahi Tombs. The cluster of tombs, Qutb Shahi tombs are located approximately one km from Golconda fort amidst the lush, beautiful, landscaped gardens known as Ibrahim Bagh. The only one of its kind in the world where an entire dynasty has been buried at one place, the tombs are dedicated to the seven out of eight Qutb Shahi kings who ruled Golconda over a period of 170 years,. The tomb's architectural excellence has withstood the passage of time. A visit to the tomb reminds us of the grandeur and glory of kings who are buried here. Golconda was under the Bahmanis (1347-1518). Following the disintegration of the Bahmani Kingdom, five new kingdoms emerged. They were the Adil Shahi at Bijapur, Baridi at Bidar, Nizam Shahi at Ahmednagar, Berar at Ellchipur and Qutb Shahi at Golconda. Sultan - Quli Qutbul Mulk, an emigrant from Hamadan (Iran), who was appointed governor of the Bahmani province of Telangana in 1496, parted ways and founded the Qutb Shahi Dynasty that lasted from 1518 up to 1687. Its origin was the Turko-Persian dynasty. Its members were collectively called as Qutb Shahis. The Qutb Shahi rulers were great builders and patrons of learning. They adopted religious tolerance, treated Hindus well and maintained cordial relations between the people of two religions. The complex has 30 tombs which include the tombs of seven kings, their queens and children, members of the royal family and the officials who faithfully served the royal family, a mortuary bath and mosques. The tombs are a standing example of a perfect synthesis of Persian and Indian architectural style, a square base with domes that have pointed arches. Each tomb is raised on a broad quadrangle terrace that can be accessed from various sided by a flight of steps. At the centre of every tomb lies the casket which crowns the vault with the crypt lying below. Domes, like the minaret are a symbol of Islamic architecture. All the tombs in Qutb Shahi tombs complex have the roofing in the form of domes. 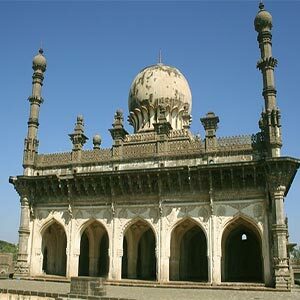 The tombs were constructed with grey granite, intricately carved stonework decorated with exquisite ornamentation. Beautiful gardens formed the backdrop and surrounded the tombs as well. In the initial days, the tombs were furnished with carpets, chandeliers and velvet canopies on silver poles. The holy book of Muslims, the Quran was kept on supports and readers recited verses during their visits to the tombs. The complex houses both small and big tombs. The smaller tombs are single storied while the larger ones are double storied. The domes were originally covered with blue and green tiles, of which only a few pieces remain now. Golden spires were fitted over the tombs of the sultans. Tombs of other members of the royal family do not have such fitting. There is one tomb which is left incomplete. The tomb of Saint Shah Raju II was left incomplete but is revered as one of the most magnificent of all the Qutb Shahi Tombs. Interestingly, most of the Qutb Shahi Kings reigned long enough to plan and execute a tomb just a little grander than their predecessor. These tombs are considered to be the oldest historical monument in Hyderabad. A unique feature of Qutb Shahi architecture is the fact that almost every tomb has a mosque attached adjacent to it. The founder of the Qutb Shahi kingdom did much to strengthen and improve the capital Golconda. Sultan Quli's subjects thought highly of him and he governed kindly and well. His rule was marked by no discrimination between people based on caste or religion. Accomplished and eligible Hindus held important positions during his regime. He was a patron of arts and was good poet in Urdu as well as Telugu which he learnt. He was 99 years when his third son Jamsheed Quli murdered him while he was praying. Sultan Quli built his tomb himself. This tomb set the design for other tombs and changes were made in accordance with time. The inscription on the tomb appears in three bands, written in Tauq and Naskh scipts. The inscription reads that he was referred to as Bada Malik, meaning The Big Master. Tomb of Jamsheed Quli Qutb Shah: Jamshed's tomb lies beside the tomb of his father. It is unique from the others in that it is built of black basalt. It is two storied and does not have any inscription. He reigned for seven years. He earned the wrath of his subjects for the inhuman act of ordering the assassination of his father. Jamshed died in 1550 of an incurable disease. His son Subhan Quli Qutub Shah who was seven years old succeeded and ruled just for seven months. There is no separate tomb for Subhan Quli Qutub. Tomb of Ibrahim Quli Qutb Shah: Ibrahim Quli Qutb Shah was Jamsheed's brother and the third son of Quli Qutub Shah. He escaped after his brother Jamshed murdered his father. He sought refuge and lived in exile in Vijayanagar Kingdom. During this period, he learnt Telugu and as a mark of love for the language patronized the learning and writing of Telugu language throughout his regime. He took keen interest in repairing and fortifying Golconda Fort. Hussain Sagar Lake and Ibrahim Bagh were planned and developed during his rule. After Jamshed's seven year old son died, Ibrahim ascended the throne and ruled the kingdom for thirty years. Ibrahim's tomb is the biggest. The tomb has two graves in the main chamber and 16 graves on the terrace, probably that of his six sons, three daughters and few members of royal family. Inscriptions in the Thulth script on all faces of the sarcophagus are visible. The entire space was once adorned with enameled tiles some of which can be seen on the southern wall. The tomb of Mohammed Quli Qutb Shah: He was the fifth sultan of the Qutb Shahi dynasty. Barely 15 years of age while ascending the throne, he ruled for thirty one years. He married a Telugu woman named Bhagirathi and named a new city after her. Many developmental activities took place during his regime like planning a new city, buildings, laying roads repairing bridges etc. It is believed that the King made use of his ancestral connections and sent for architects from Iran while the city of Bhaganagar was getting ready. He even invited many Persians to settle down in Hyderabad and Machilipatnam. The architectural centerpiece, the Charminar in Hyderabad is one his magnificent contributions to the world of architecture. He laid the foundation for the great mosque known as Mecca Masjid in Hyderabad. He has also shared his architectural expertise in designing the Great Mosque. His rule was marked by people living in peace and an able and stable administration. If Ibrahim's tomb is regarded the biggest tomb, Quli Qutub Shah's is regarded as the grandest of all Qutb Shahi tombs. The tomb is atop a terrace. A flight of steps leads to the terrace. Inscriptions in Persian and Naskh scripts provide insight into the glorious years of regime. From the terrace, visitors enjoy a beautiful panorama of the Golconda fort in the foreground and the Charminar, Mecca Masjid and the Old City on the horizon. Tomb of Sultan, Muhammad Qutub Shah: During his period, the history of Qutb Shahi Dynasty was compiled. Not much is know about this sixth Sultan of Qutb Shahi Dynasty. The tomb looks majestic, has six graves with inscriptions in Taliq and Naskh (Islamic calligraphy) scripts. Tomb of Abdullah Qutb Shah: Sultan Muhammad, Abdullah ascended the throne at the age of twelve. He loved poetry and music. But his indolent attitude set the pace for the fall of Qutb Shahi Dynasty. It came under Mughal pressure and Golconda was attacked. He was forced to accept and adhere to severe conditions imposed by Aurangazeb. Heavy taxes were levied. His daughter was married to Aurangazeb's Son Sultan Mohammed. After Abdullah Qutb Shah's death, his son-in-law Abul Hasan Qutb Shah ascended the throne. He was the last king of Golconda. When he died, he was not buried in the Qutb Shahi Tomb complex but in a modest grave at Khuldabad near Aurangabad. Other tombs: The Qutb Shahi tomb complex has tombs of many members of the royal family. The tomb of the great Sufi saint Husain Wali, who built Husain Sagar (1562), bridging Hyderabad and Secunderabad, pair of tombs of Premamati and Taramati, sisters who entertained the kings with their classical dance performances, the tomb of Mohammed Neknam Khan who served as the commander-in-chief of Abdullah's army etc are other tombs besides those of members of royal family which are within the precincts of the Qutb Shahi Tomb complex. When to visit: The complex is open to visitors from 9.30 am to 4.30 pm on all days except Friday. Entry fee: Visitors are charged Rs. 10 to 20 for Indians and Rs. 100 for Foreign Nationals. Annual festival: Every year the Deccan Festival is held at the Qutb Shahi Tomb complex. It is an opportunity to learn about the city of Hyderabad, the kingdoms and its rulers who were part of its development. In 2012, the festival will be held from 24 to 28th February. It is a confluence of arts, crafts, culture and Nawabi cuisine. Popular singers and dancers are invited to perform and enthrall the audience.